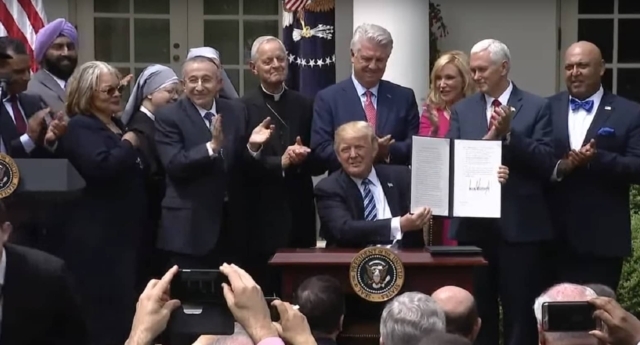 Catholic News World : US President Donald Trump Signs Order to Protect Religious Freedom "Prayer has always been at the center....America is a nation of believers..."
US President Donald Trump Signs Order to Protect Religious Freedom "Prayer has always been at the center....America is a nation of believers..."
"During the annual National Day of Prayer commemoration at the White House on Thursday, President Trump signed the latest executive order of his presidency, to establish a faith-based office, the White House Faith and Opportunity Initiative. He said it would focus on protecting religious freedom and ensuring that 'the faith-based and community organizations that form the bedrock of our society have strong advocates in the White House and throughout the federal government,'" reports CBS. "Prayer has always been at the center of the American life. America is a nation of believers, and together we are strengthened by the power of prayer,"
"We take this step because we know that in solving the many many problems and our great challenges, faith is more powerful than government and nothing is more powerful than God," said Pres. Trump.